The spell should be ineffective because my protagonist is protected by Spell Deflection and Globe of Invulnerability. However, Summon Insects bypasses both protections and hits my protagonist anyway. Since that moment my protagonist gets 3 piercing damage every few seconds. He gets 1 extra damage from the difficulty, but that's still 2 damage every few seconds. The description of the spell says it does only 1 damage. 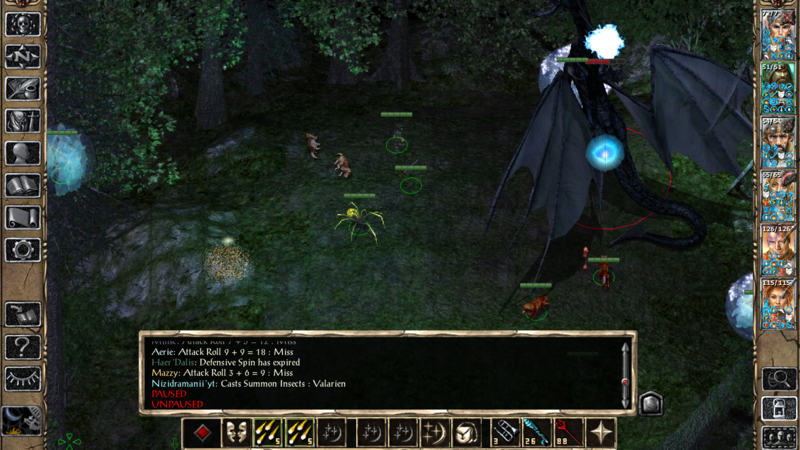 Worst of all, Summon Insects acts as an AoE spell and hits also Minsc and my summoned ettercap, who were standing close to my protagonist, minding their own business. The description of the spell says that the area of effect is 1 creature. Is this a bug (or several bugs)? Mods: Ascension, Tweaks Anthology, SCS, Portraits everywhere, Lighting pack, Jimfix and EE UI Tweaks. Are sure its not "Insect Plague" that is being cast? Because that sounds like insect plague. I can't speak for SCS, but in vanilla, insect plague can ONLY be blocked by magic resistance and maybe spell immunity. Even being untargetable doesn't help, as the AOE will spread to characters anyway. However, the actual spell behaves very much like Insect Plague indeed: After a while Minsc got scared and started to run in fear when there was no apparent reason for him to do so. Also, in a second attempt I observed how it jumps from the first target to the closest one. So maybe the bug is simply that the game is using the wrong name for the spell. I attach a save in case you want to test it yourself. I've done about half a dozen tests, and the dragon always casts Insect Summons (or whatever spell it really is) after a few rounds. also i can not speak for scs. but in vanilla insect plague is not a real aoe spell, it has to be cast against a target, even if after spread to his allies affecting up to 6 creatures. is also true that MR can block it, but not block the spread, so targeting an enemy with high magic resistance has a great chance to fail, but if an enemy with low magic resistance is targeted instead the insects jump to the high resistant one ignoring his MR.
seeing the screenshot, the damage done and the fact that more of a toon or friendly summon is affected it seems that an insect plague has been cast, even if the feedback tell other way, even the morale failure of minsc is typical of the plague. but maybe in scs it is different, as you play it you should know about. It's Creeping Doom, just wrongly named. It's a monster-only version specific to Dragons. Thank you for clarifying, @kjeron, I've updated the title to confirm it's a bug. now you have to discover if the bug is from the vanilla game or is mod related. to claim in the title that something is a bug if a mod creates the bug can be misleading. Black dragons' innate Summon Insects is a bespoke ability, not identical to the third-level druid spell. (I don't think it's quite identical to Creeping Doom either, though it's much closer to it.) It counts as a seventh-level spell, bypasses magic resistance (I guess because the insects are just under the dragon's command?) and inflicts 2 hp damage per second. So I think everything is working correctly and there's no bug here. Black dragons' innate Summon Insects is a bespoke ability, not identical to the third-level druid spell. Thank you for clarifying. However, I thought that the word "casts" in the combat log indicates a spell rather than an ability. Did I get that wrong? The engine doesn't particularly distinguish between spells and abilities. (I don't know exactly how it decides to display 'casts', though. That's a bad argument, I think. The insects in the common spell are also under the caster's command. So either both or none spells should bypass MR. It's only missing the Panic effect of Creeping Doom, possibly since dragon's already have an innate fear ability. Neither bypass MR unmodded. "Casts" indicates it's spell type isn't "Innate" and that it is cast through either the Spell() or SpellNoDec() actions (or their Point variants). Unmodded, it's not "Casts", as it uses "ForceSpell()". You're right, I misread the description. "Casts" indicates it's spell type isn't "Innate"
What does that mean, what is an innate spell type? Like others said, the abiltiy in question is not the same level 3 druid spell summon insects. It is a special ability exclusive to that black dragon. It affects multiple targets and does a lot of damage. IIRC it also has a plant growth ability which looks like an entangle spell but also does damage.